A typical PV system uses panels of solar cells, made from semi-conducting materials that react with sunlight to produce electricity. This electricity is then transferred into the property to power appliances and provide lighting, or if surplus to requirements, is sold to the local electricity network. Solar cells are the power units of every PV system. A PV cell consists of two thin layers of semi-conducting materials, usually silicon , that have been treated with chemical substances. These chemicals react to sunlight when it shines on the cell, creating an electric field across the layers and producing electricity. The greater the intensity of sunlight, the greater the flow of electricity. This process is called the 'photovoltaic effect' and is explained in greater detail below. 1. The cell is covered with a thin layer of anti-reflective coating (ARC) to minimize light reflection. almost every thousandth silicon atom is replaced by a phosphorus atom. This creates free moving negative charges called 'electrons'. that almost every millionth silicon atom is replaced by a boron atom. This creates free moving positive charges called 'holes'. charged 'holes' and the negatively charged 'electrons' are attracted to each other. As they move into their respective neighboring layers they cross a boundary layer called the 'p-n junction'. This movement of negatively and positively charged particles generates a strong electrical field across the p-n junction. When sunlight strikes this field it causes the electron particles and the hole particles to separate, which in turn creates a voltage of around 0.5V. where it is conducted away along the wiring circuitry that connects the cells together. Solar cells can be made from a number of semi-conducting materials. A semi-conducting material is one that has a limited capacity for conducting an electrical current and those used in solar cells are all uniquely suited to producing electricity from sunlight - the photovoltaic effect. By far the most commonly used material is silicon, which is the main component of quartz sand and, after oxygen, is the second most common element in the Earth's crust. The performance of a solar cell is measured in terms of its efficiency at turning solar radiation or 'sunlight' into electricity. A typical solar cell has an efficiency no greater than 13 - 15% as only a portion of the sunlight energy spectrum can be converted into electricity and much of the sunlight is reflected or absorbed by the materials that make up the cell. If this seems off putting bear in mind that a gas power station has an energy conversion efficiency of only 35% and that 70% of the electricity generated is lost during the long distance transmission to the consumers- you and I. Here is an overview as to the properties of the types of commercial solar cell available today. Monocrystalline 13% - 15% > 30 years *Highest efficiency = least surface area required so most suitable for properties with limited roof area. *Most expensive due to complicated manufacturing process. Polycrystalline 10% - 13% > 25 years Most commonly used type of cell as offers good efficiency at reasonable cost. As an individual solar cell only generates a low voltage, approx 0.5V, a number of cells are wired together to form a solar panel or 'module' that can generate anything between 80-165kWp. Modules are then connected together to form a PV array that will be typically fitted onto a southerly facing roof at an angle of between 30º and 50º in order to receive maximum sunlight. South-easterly and south-westerly facing systems can be installed with only a 5% reduction in panel efficiency but panels placed on a northerly orientation do not receive adequate sunlight to generate sufficient electricity. It is extremely important that all the solar panels in a system are free from shading during the daylight hours. Even the partial shading of one cell in a panel will lower its power output. As the cells of a panel are connected in series the weakest cell will bring the others down to its lowered power level, which can reduce the efficiency of the whole panel by as much as fifty percent. PV systems are quoted in kWp (kilo Watts peak), which is the rating of DC power produced by the system at any one time during optimum lighting and temp erature conditions. The DC power needs to be converted into AC before it can be used with household appliances or is transferred onto the national energy grid. This is done via an inverter, and, through the exchange process some power is lost. A well installed PV system should produce between 750kWh and 850kWh of AC electricity annually for every 1kWp of PV installed. Grid-connected photovoltaic systems are the most common type as they make use of the existing mains electricity grid. They are simpler in design and easier for the installers to fit than off grid systems. The electricity produced during the daytime is either used by the property owner, or directed back into the electricity grid and purchased by a utility company, an arrangement called 'net metering'. At night, or on dark days when the panels do not produce sufficient power, electricity will be supplied via normal utility company grid system. Far less common is an "off grid" or 'stand alone' system, which produces and stores power independently from the utility grid. These systems are particularly suitable in remote locations especially those where the property is more than one-quarter mile from the nearest power lines. Often the installation of an off grid PV system proves more cost-effective than extending the power lines. 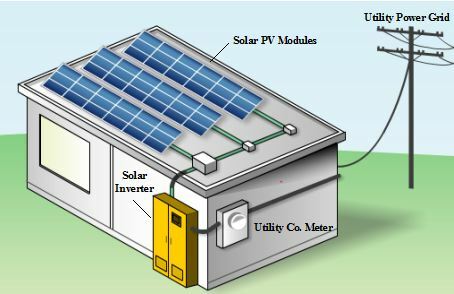 The electricity generated by the panels is stored in a bank of rechargeable batteries as DC but in order to power household appliances an inverter will be required to convert the stored DC to AC. These rechargeable batteries contain specialised parts and chemicals not found in disposable batteries and are therefore larger and more expensive to purchase and maintain.